Because I was attending the International Journalism Festival when Dylan Byers published his click-bait piece “Jill Abramson loses the newsroom” on Politico, I initially intended to respond just with disapproving tweets. Then Emily Bell slammed the piece for its sexist tone better than I could have. And I initially thought I’d respond just with approving tweets. 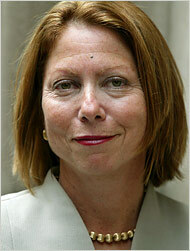 After all, I don’t know Jill Abramson. And she doesn’t need me to defend her (great response from her, cited in Huffington Post). I had no idea whether the story was true or not, though I had serious doubts because it relied heavily on unnamed and unaccountable sources. But as I considered it, I thought that a male voice, a former editor who might have supposedly “lost” a newsroom, might have some value and I started pondering a post. Then I heard Aron Pilhofer tell an Abramson story at the festival and I decided I’d better blog about this. Most of the editors I’ve worked for have been men. That’s probably true of most people in the news business because the vast majority of editors are men. While women have made strides, men still dominate in newsroom leadership. I used to watch the crowds in airport lounges when I traveled, studying how people read newspapers. Even with circulation declining, you could see people reading newspapers intently. Especially after 2001, people would have plenty of time to read while waiting for flights, and newsstands stocked a variety of papers to choose from. Look around an airport lounge now. You’ll see more people looking into their phones than holding newspapers.